This has been one of those weeks...everything (including my designs-in-progress) sort of took a detour and I am now getting back to the track I was on a few days ago. A long-time friend who we thought of as family passed away from a brain cancer. I won't go into more; I know everyone understands. A couple of days later I had a milestone birthday. I am not going to say the number, but I've qualified for a discount at three places since. I often think of more than one idea, and this time was no exception. (In fact, I had more ideas I had intended to play around with but, well, you know...). 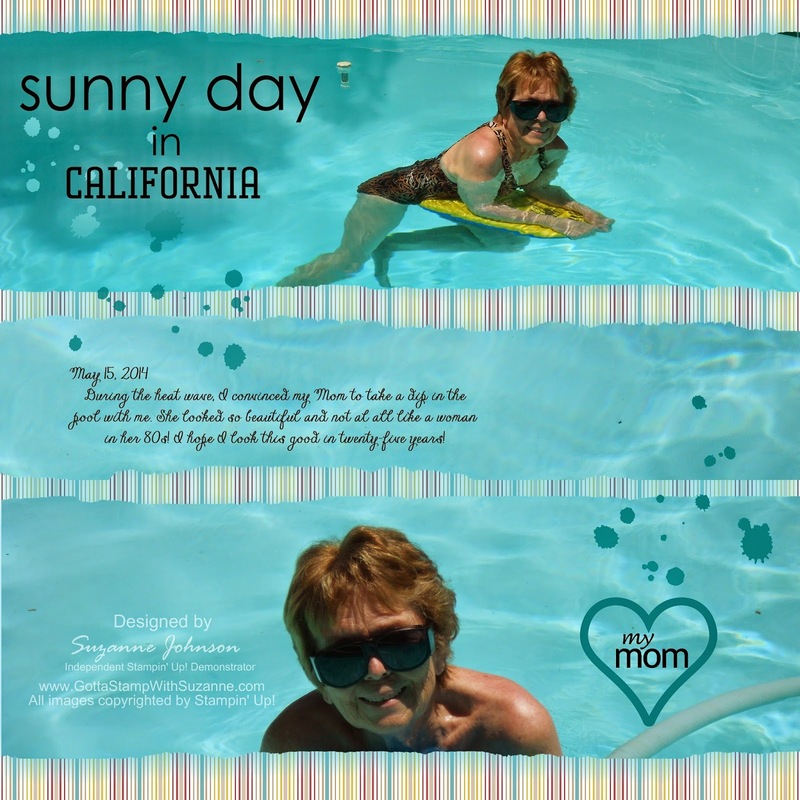 When I was visiting my mom in the spring, I snapped a few photos of her in the pool - can you believe she is in her 80s? These may be my current favorite snaps of her. I love the color and texture of the pool water as a natural background. 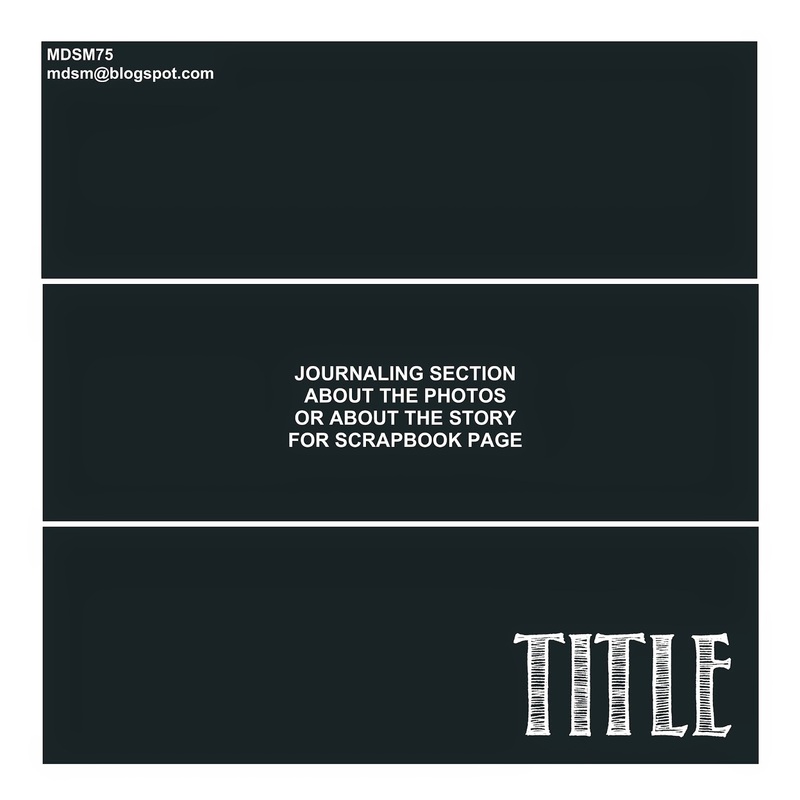 With a template like this one, the layout is fairly simple and when the photos take center stage, there often is no need for much more (stamps, embellishments), and such things could distract from the photos. So, you will see that on this design and my others, I did not add too much. I used the "rip edges" tool on this layout and a full-blur shadow to add subtle texture and depth. The words "sunny day" and "California" are stampbrushes, but "in" is text. The heart and "my mom" are two separate stampbrushes, and the splatters are also stamps. Choosing the background was hard because I really liked several in the "Birds of a Feather" collection. I finally selected pattern #10 because the stripes made me think of umbrellas and beach towels. 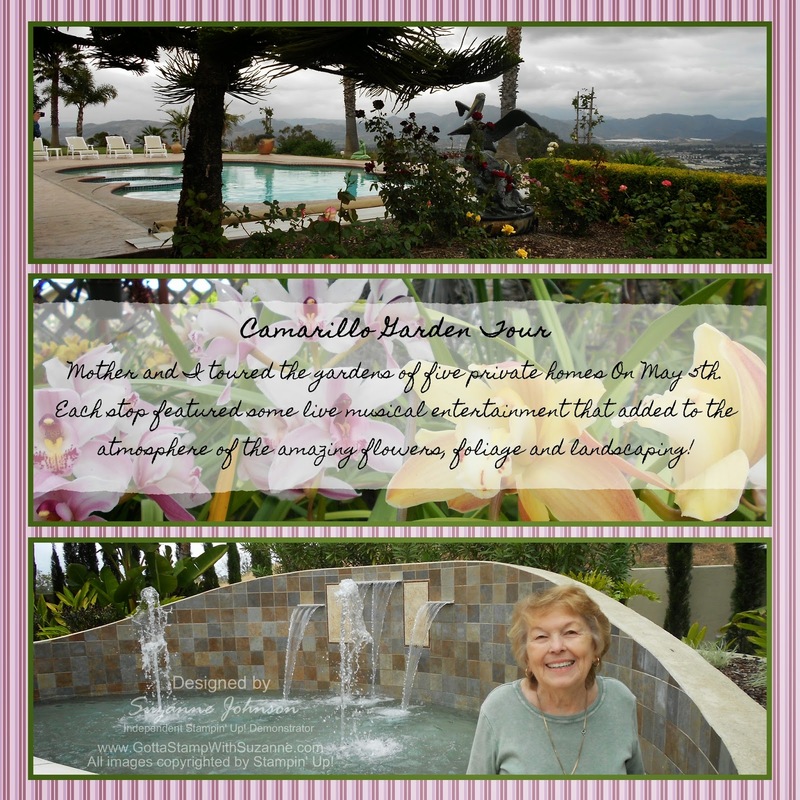 My next page layout is a recollection of a garden tour I took with my mom last year. Pattern #12 from the "Cottage Wall" DSP collection coordinated really well with the close-up of orchids I used as a background for the center journaling pattern. Choosing two out of the dozens of photos I took on our tour. I had to choose ones that were not only balanced for a wide-looking crop, but that could also lose some top and/or bottom to cropping. 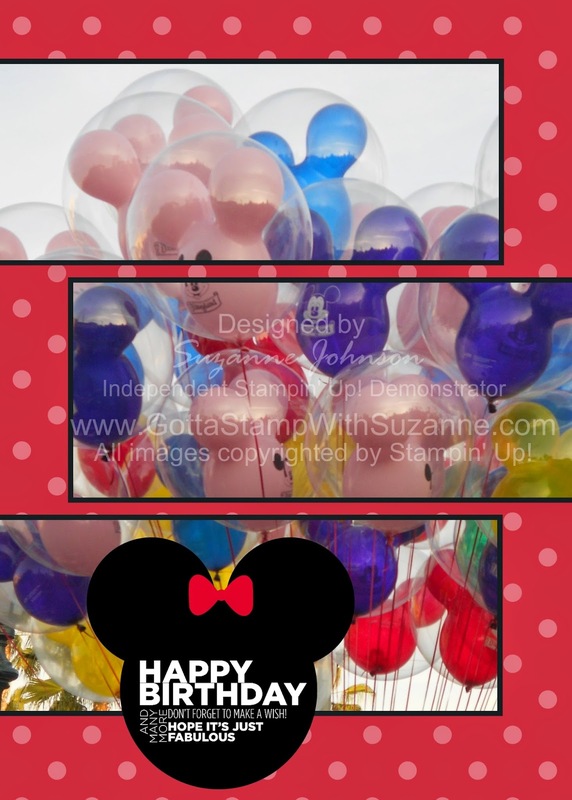 My last sample for the challenge is a card featuring a photo of Micky Mouse balloons I took at Disneyland a few months ago. At the time, I thought a photo of them might work well for a birthday card, and it turned out I was right! I cropped the photo three times and aligned the segments to reconstruct the original image. I used circle punches to build the Minnie Mouse head and added the bow stamp from "New Heights." The sentiment stamp is from "Delightful Dozen," however, I cropped some of the words off so it would work better and fit inside the circle. The background is the Real Red Large Polka Dots. Love ALL of your pages using this template Suzanne, what a great variety of ideas! (Your mom does look fantastic!!!) Thanks for joining us this week at MDS Monday. Wonderful job with the sketch - your photos are beautiful. wow Suzanne, these are all great! love the way you did the balloons on that card! Beautiful samples, Suzanne! I love the beautiful photos, and your use of the layout for the card is really impressive! Love it! Thanks for joining MDS Monday.